Lilongwe, Malawi … As the Malawi Project assists agricultural co-ops, churches and village communities, each step toward independence is difficult, time-consuming, and expensive. To plant ideas, wait for them to take root, then take the next step takes time. This is especially evident in the area of agriculture, where old patterns die hard, and new ideas are greeted with doubt and questions. This is evident, even in the face of great success. Each step is a step forward, but each gain brings new challenges. Here are the steps taken thus far. Step One is education. No change can occur until people understand the idea. This has been accomplished through first printings of 10,000 booklets; 5,000 in English, and 5,000 in Chichewa. These booklets deal with the problems associated with not preparing for crop failures. They highlight the need to plan ahead and prepare and explain proven methods for dealing with food shortage problems. Step Two encourages the formation of farm cooperatives where communities come together in united groups for buying power, land cultivation, joint storage of grain reserves, and marketing potential for future income. Step Three is the introduction of drip irrigation systems, and proper training, in order for a second harvest to be realized during the dry season. These can potentially double crop production in a single year. Step Four has been the introduction of V-tractors, in test areas of Malawi. These are small, innovative, but powerful, farm tractors that can increase land cultivation many times over, when compared to the conventional hand hoe that is universally in use in Malawi. These units have proven quite effective in some situations, but offer challenges in other more remote areas. Step Five brings construction and use of grain storage warehouses commonly known as Joseph Projects. This concept imitates Joseph in the Old Testament when he knew famine was coming and rallied the people to create storage areas large enough for grain reserve against the food shortages. Today, this program uses large warehouses to offer safe storage of grain for families and community support. In traditional bamboo storage units as much as 15 to 25% of a years harvest can be lost to insects and disease. The community warehouse can erase this negative impact. Step Six deals with transporting excess production to market to generate income for the community. Obviously, for a woman to put a 100 kg bag on her head, and then walk twenty or thirty kilometers to market won’t accomplish the task, yet in far too many cases the woman carrying the load is the only way to reach the market. in 1989 Arnold Wendroff Ph.D., a former Peace Crop worker introduced an innovative means for transporting goods called the Malawi Handcart. These carts are simple, affordable, and offer wheeled transportation to move heavy loads over long distances. During a recent trip to Malawi members of the Project’s Board of Directors, along with Robert Gabrielse from Mobility Worldwide, met with members of the administration at the Lilongwe University of Agriculture and Natural Resources, (formerly Bunda College). The meeting was to explore ways the handcart program can move forward, and whether the American teams can play a part in giving this effort a boost. 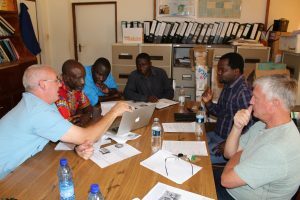 The results of the meeting were a deeper knowledge of the handcart, its potential for Malawi, and the part the University would like to play in its production and distribution. Pictured are Bob Gabrielse (left) explaining the type of wheels being used in the production of the mobility units his group manufactures, the agriculture administration officials, and on the far right Wilson Tembo, and Jim Messenger, from the Project. In attendance, but not pictured, is Richard Stephens.